A brief break down of the course and its modules to help give you a better idea of what is coming up and where the focus of the course lies. Getting the right people to turn up on the night can make or break a course. The course works best when there are people to discuss ideas and thoughts with. So it is important that you get the right people to turn up. We have some ideas that have helped us. Finished the course and looking for the next challenge? Perhaps you want to get involved, serve overseas or link in with other people actively engaging with local Muslims in your area. If you are serious about training for Christian witness to Muslims in the UK then we have more training and can help you obtain a deeper level of understanding. How do I book a speaker to help kick off the course? How regularly should we run the course? Interserve is a deeply experienced movement sharing God’s love with the peoples of Asia and the Arab world. A ‘fellowship of disciples’ and a ‘discipling fellowship’ focused on wholistic mission with an inner core of competent, skilled and highly motivated long-term workers transforming lives and communities through encounter with Jesus. A mission leader, analyst, trainer and author, Steve is a recognised cross-cultural communicator with 35 years’ experience in 100 countries. His Passion is to facilitate 'ordinary' Christians discussing good news with 'ordinary' Muslims with an attitude of grace and truth. Tim Green lived in the heart of the Muslim community in Lancashire before joining Interserve in 1988. He and his wife, Rachel, worked for nearly 16 years in Pakistan, where they enjoyed bringing up their three children, followed by two years in Jordan. He holds degrees from Cambridge and London Universities, including a master's degree in Islamic Societies and Cultures and a PhD from SOAS in London. Not sure how to start talking to Muslim neighbours? Nervous about Muslim presence in Britain? Want to better understand your Muslim friend or colleague? Is multiculturalism God’s plan for my community? Considering starting cross cultural ministry? 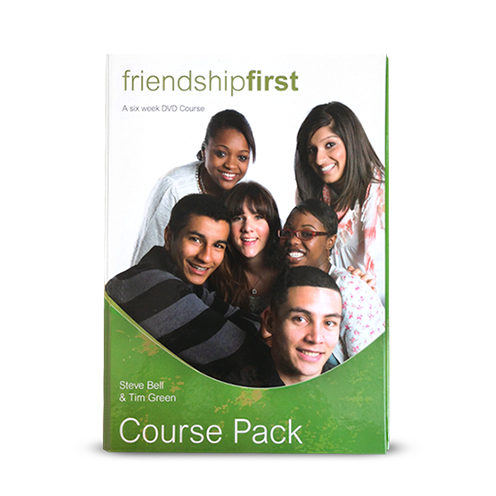 The Friendship First Course is an interactive, non-specialist course in six-sessions. It enables Christians to approach their Muslim friends with confidence by equipping them with the skill and resources needed to be an effective witness to Jesus Christ. Growing from an initial response to the 9/11 and 7/7 attacks the Friendship First approach has grown into a successful course now running across Britain and beyond. It has transformed the way Christians relate the gospel to the Muslims they come into contact with. We think this course is life changing, but don't take our word for it. No planning is required, all you need is 6 meetings. You will receive a course pack with a leaders guide, study manual and DVDs. Run it with your current small group or advertise this special new course. This course will raise questions and provoke thoughts. If, during the course, you come across difficult topics, have questions that are not answered, or have experiences you don't understand, then please get in touch and we will help you in any way that we can. And when you've finished, come and post your experiences so we can make this course even better. Then, explore what your next steps will be and what further opportunities are available to you.